"Video is an authentic, powerful and honest mass communication media which should be in the hands of common people in a country like ours". Communication is a very important aspect of poor, self employed womens lives and struggles. These women communicate in their own way and with various groups in society. Over the years, SEWA has found that communication, the transfer of information, plays a very crucial role in the lives of poor women workers. Thus there is a great need for communication, between groups of self employed women, and between them and the public, policy planners and other government officials. There is also a need for workers to obtain information on various issues: legal, health, nutrition, and government policies and programmes for the self employed, including national development plans and programmes. Self employed workers also need to communicate their needs, their concerns and experiences to the public at large. The middle class public is, by and large, unaware of poor womens reality. Workers encounter prejudice, discrimination and even abuse from other sections of society. With greater communication, the public begins to become aware of poor womens very existence and their contribution to society. A sense of working together and learning from each other may also develop. Knowledge and information on various issues of importance to them like legislation and health, never reach self employed workers. Nor do they obtain information on existing government and non-government programmes and policies which could have an impact on their lives and struggles. SEWA has been attempting to share this information with women, recognising that it has an important role to play in their struggles. Once this information is communicated to the workers, attempts are made to utilise this for purpose of action. Thus providing information on a multitude of issues affecting workers lives itself can support and encourage the process of organising. 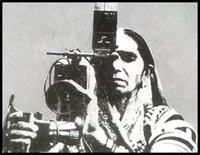 Video SEWA was established in 1984 as a means to provide training to the members of SEWA and to motivate, mobilize and strengthen the existing membership of SEWA through the use of video recordings and tapes. 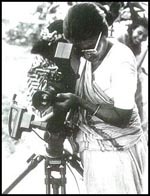 Since 1984, Video SEWA has produced countless tapes and more than a hundred programmes of organizing, training and advocacy. These tapes reached villagers and slum dwellers in Gujarat as well as policy makers in Delhi and Washington. Gradually, video has become an integral part of SEWAs activities and also for all the ongoing work. 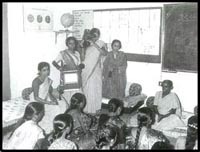 For women workers and the members of SEWA, SEWA tapes are a source of information as well as inspiration. The Video Sewa team includes members coming from the informal sector like head loaders, vegetable vendors, home-based workers etc. but after joining video Sewa undertook technical training of the equipments and today are producers of various educational and informative programs. Produce educational and informative programs related to the socio  economic lives of the self-employed women regarding the different services provided by Sewa like healthcare and childcare, to bring awareness and help in their capacity building and become self reliant. To provide information related to different types of work, guide them and help them progress. Develop women leaders by video so as to do various activities like savings business related to their progress.